The largest employer in Tattnall County is the Georgia Department of Corrections with three state prisons in the county employing nearly 1,400 people. Much of the county's growth in the past 35 years can be attributed to the growth of these facilities. Georgia State Prison, located in unincorporated Tattnall County outside of Reidsville, is the main maximum security facility in Georgia. The historic prison houses approximately 1,550 inmates and is one of the region's largest emplyers. The prison was designed by Tucker amd Howell and opened in 1937. The modern classic building was enriched with a Julian Harris sculpture, a frieze of emblematic figures representing trades and occupations, entitled Rehabilitation. Many renovations were made. The expanding crime rate has added a multitude of buildings that span from the original structure. It has all security levels (Trusty to Maximum including Hi-Maximum) inmates. This prison houses some of the most dangerous inmates in the State of Georgia. The prison has counseling programs that rival many in the country aimed at reducing the recidivism rate. Remodeled in 1979, the prison consists of nine buildings containing four two-tiered cellblocks with single cells. Cellblocks are organized into a general population unit, special management units, MH/MR Units, and a 26 bed surgical unit. The facility also houses a Special Management Unit (SMU), a C.E.R.T. Team, two Tactical Squads, a Canine Unit, and a Fire Station. Offenders assigned to the Fire Team reside away from the main compound at the Fire station. 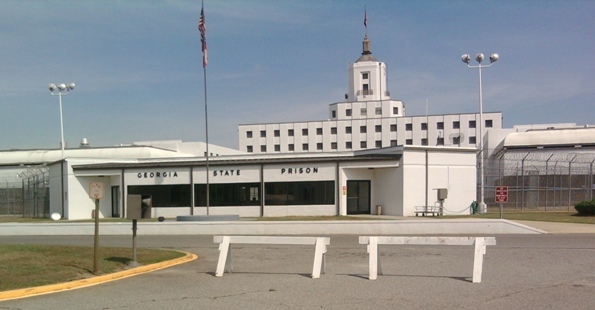 Georgia State Prison was the first US prison to be accredited by the American Medical Association and the American Correctional Association. The Georgia General Assembly passed a law on August 16, 1924 that abolished hanging for all capital crimes. From that point forward, instead of being hanged by the sheriff of the county or judicial circuit where their crimes had occurred, the condemned were to be electrocuted at the Georgia State Prison at Milledgeville. During that year an electric chair was installed in the prison, and the first execution in that method occurred on September 13, 1924. On January 1, 1938 the execution chamber was relocated to the new Georgia State Prison at Reidsville. In the 1940s and 1950s, volunteers were offered $25 to flip the switches which would start the flow of electricity and eventually lead to the death of the prisoner. Executions were moved to the Georgia Diagnostic and Classification State Prison near Jackson, in Butts County, in June 1980. The state's old electric chair can still be found in the museum on the upper floors of the main building, as well as prison documents containing names, authorizations and last statements of the prisoners. Dr. Martin Luther King, Jr. was transferred from the Dekalb County Jail in Decatur, Georgia, to Georgia State Prison in Reidsville, Georgia. He was released on October 27, 1960 on a $2,000 bond. GSP also housed radical activist H. Rap Brown, now known as Jamil Al-Amin. Al-Amin was the chairman of SNCC in the late 1960s. In 2007, he was transferred to a federal facility where he now resides. The facility also housed notorious Atlanta killer Wayne Williams.